My father invited a bunch of us to meet at Jose’s for dinner a couple of weeks ago. Bradenton is a trek and a half from where I work, but since a few family members were in town visiting, it was definitely an invitation I didn’t want to pass up. When we pulled into the parking lot, it really looked like a dive. Knowing that my father doesn’t mess around about awesome food, I trusted that looks would be deceiving and it would be a great meal. Apparently, Jose’s was featured on Diners, Drive-ins and Dives not too long ago. Ever since then, the local devotees are probably a little pissed off that the secret is out. My dad had pre-ordered the paella, sangria and plantains for all of us so as soon as we sat down, everything was on it’s way out. The sangria was poured and I immediately noticed how different it looked from the sangria that’s served in most (way less authentic) places around here. It was a rich, dark purple-brown and had a wonderful cinnamon flavor to it. It tasted much more complex, with spices and different layers of flavor, than the fruit-juicy mixes I’m usually served. 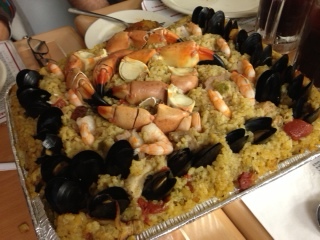 The HUGE tray of paella was incredible looking. The menu says it will feed 8. There were 8 of us and we ended up taking almost half a tray home with us, and we are all pretty good eaters. Piled on top of a mountain of rice were mussels, lobster, shrimp, chicken, and sausage. The amount of food was really pretty insane. It seriously was enough for at least a dozen people- then again, we DID each have a side of plantains, so maybe without that we could have made a bigger dent. The plantains were delicious. Crisp edges, perfectly cooked, slightly caramelized. This side dish really could have been dessert. There really wasn’t enough room left for dessert, but we were all dying to try the flan. We were only slightly disappointed when we were told that there wasn’t any left. We were really ready to go anyway, all feeling pretty sleepy from carb overload. I guess they felt bad that they were all out because the next thing we knew, they’d brought over a bread pudding for us to share. We all silently groaned looking at a dense, bread-y dessert that none of us really wanted or had space in our stomachs for. We each had a bite, and frankly, it kind of tasted like a heavy muffin wet with caramel sauce. Not really my thing, and not worth trying to stuff it in my already too-full belly. Overall, the whole meal was really quite good. I’d love to go back to try some of the other dishes on the menu- especially the black bean soup, which the menu claims is ‘the best in the world’. I actually believe that might be true and will have to make a point to go find out!